We flew into the capital of the Czech Republic, Prague, on a winters afternoon, over dazzling snowfields, broken up by small forrest tracts. You have to remember that snow is a novelty to Aussies, we are more likely to see red dust on the side of the tarmac. It really was a wonderful sight, surreal almost or should we say Kafkaesque? Fortunately the runways were clear and we landed without incident. We negotiated customs and passport control without a hitch which was a marked contrast from our departure from Turkey, where it took over two hours to get our baggage checked, even though we had already checked in online. On top of that an overzealous official decided that Ian’s back pack had to be completely unloaded, due apparently, to a suspicious 4 port power board. What was more amusing was her complete bafflement at Ian’s UE Boom speaker. She handled it like a grenade as we tried to explain what it was, thankfully Cath’s exhortations of “le musical “(note she always lapses into French when speaking a language she doesn’t know) appears to be an internationally understood term. Thanks to Cath’s previous experience of Prague, it took next to no time to find the bus from the airport into the city and then the tram to our AirBnB apartment. 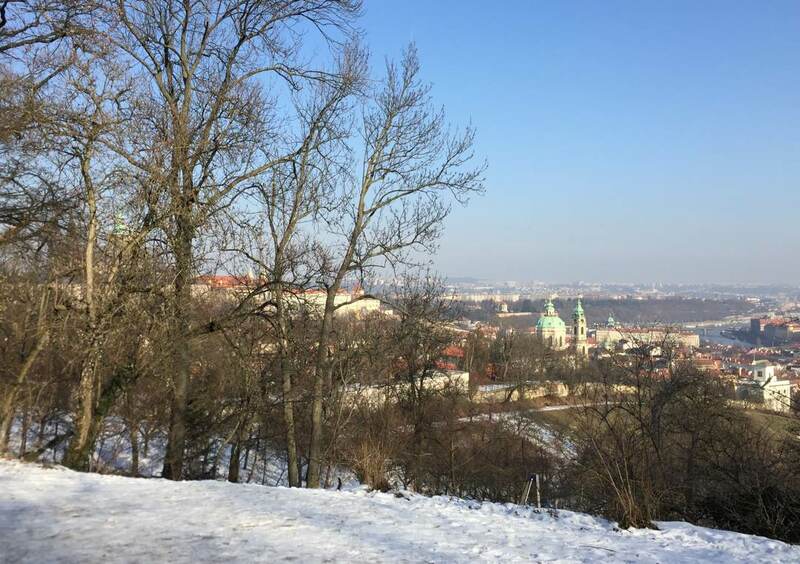 Ian was completely blown away by the gorgeous baroque buildings, orderly streets and traffic, cobbled pathways and numerous parks; he is not the only one, Gabriela from I am a Foodie Traveller had the same visceral response to her arrival in Prague. As the tram trundled along, it was wonderful to catch glimpses of tall gold tipped spires and ornately decorated streets and buildings. With no offence to Istanbul, or Iran, it really did feel as though we had finally found civilisation, as we know it, again. Our apartment was immaculate, located on the second floor (although they call it 3rd, as the ground floor is referred to as 1st) of a baroque building only one block from the Vltava river. We headed out to a nearby Tesco’s and bought provisions, including a bottle of Shiraz and one of Savignon Blanc- risky given we don’t speak Bohemian. We were a little worried that we may have overdone it, as the bill was 628 Kroner, until we did our conversions and realised it amounted to just under $33 AUD. The wine? About $3AUD a bottle! At that price you would expect pretty awful wine, but you’d be wrong. The Shiraz was quite drinkable and the Sav Blanc ok but nothing to rave about, but at $3AUD a bottle, who is complaining? It was a very pleasant evening, curled up in a modern, warm and cosy flat, excellent wifi speeds and a home cooked meal by the cheese and kisses. We decided that although it was technically Monday, we would call it Saturday and so slept in before arising late and having a marvellous cooked breakfast of bacon and eggs. For those who don’t know, Saturday morning is sacred when we are home and there is always cooked breakfast, in bed. Well Cath is in bed, Ian is in the kitchen (as it should be!!). Ah the small things… Then we were off into the town. Everything is so close to the apartment that we didn’t bother with transport, Prague is a wonderful city to walk in, no matter the weather. The river is flowing and there is little ice, so there were plenty of ducks and numerous big white swans ducking their heads into the chilly waters. Poor buggers; it certainly looked like spanner water to Ian. The city is so pretty. Gold topped ornaments, spires, statues. Buildings adorned with all kinds of creatures, gargoyles, cherubs and angels. The Charles Bridge, an icon of the city, has the most amazing number of statues, but Cath was determined to take Ian to Wenceslas Square to see the astronomical clock, so we plowed on. Ian absolutely loved it all, commenting that it was the nearest to a fairytale he had seen. After meandering our way out of the square to the markets, it was time to warm up a bit and we stopped for a strudel and warmed cinnamon apple juice before deciding that it was best to head home to avoid the “freezing fog” and -8C weather. What a “freezing fog” is, we remain unsure but it sure is cold and allows an afternoon of nibbling, reading, planning and wine of course. Our neighbourhood, Praha 5, has many shops, delis, wine and beer bars, restaurants and bakeries. Naturally it was our duty to explore them and our lovely Airbnb host Zuzana had left some recommendations. As is our way we have found a local pub, Restaurace U Svatèho Filipa a Jakuba and settled in for a few of the best Czech Urquell Pilsners, Cath struggled with lifting the enormous glass to her mouth, pretty unusual for this girl not to be able to get a drink in, but they are very heavy. Typically Aussie, it was home for a feed of steak and veg. Whilst we do like to try the local fare, it seemed like forever since we’d had an Aussie meal. We were left wondering what Queensland steak is, as it was labelled at Tescos, never mind what it was called it was scrumptious. Tuesday was even colder, and we awoke to see tiny snowflakes tumbling down. After another of Cath’s fine omelettes, we were off to see the castle. The cobbled pavements were slippery and we had to walk carefully, like a couple of penguins, but we eventually struggled to the top of the hill where we found the largest castle in Europe. Along the way, delightful streetscapes greeted the eye in every direction; from the many statues of Charles Bridge, crenallated walls, buildings tizzied up like so many birthday cakes and of course sprinklings of gold atop church spires and various other decorations. Prague, it must be said, is a beautiful romantic city and you do expect a princess to appear from her salon. 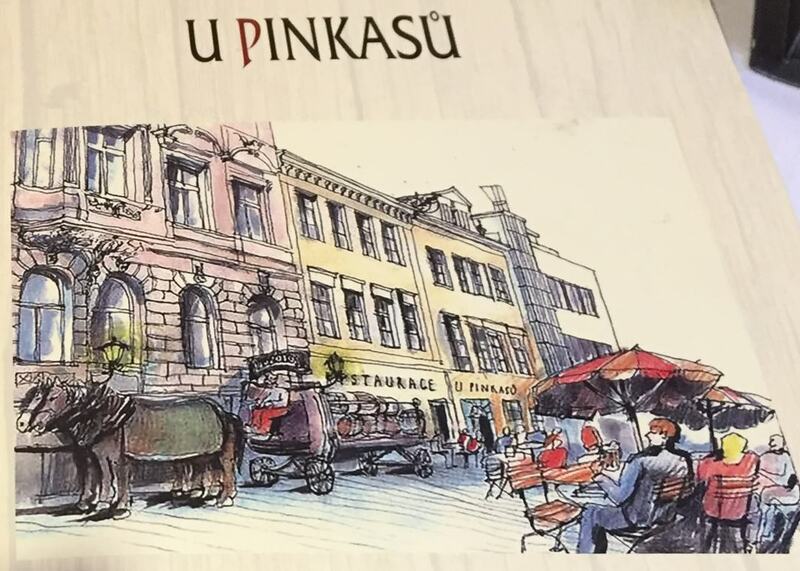 We waddled carefully up the hill and after admiring the view tip toed down to spend a half hour in yet another Irish pub, out of the snow, whilst we established our next goal, a traditional Czech restaurant recommended by our host, U Pinkasu. On our return home from U Pinkasu we spent the evening like two big fat hippos, wallowing on the couch, watching 80’s music videos in Czech. 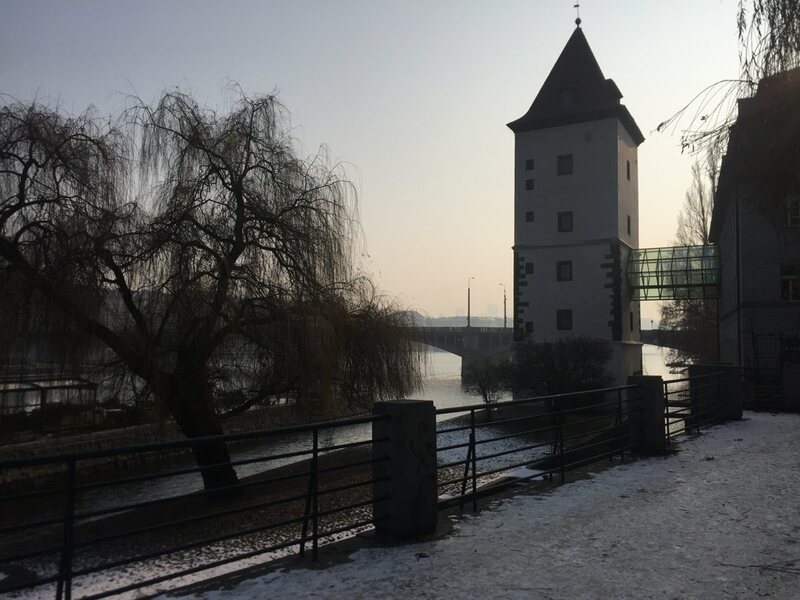 We awoke from our food coma ready to find some culture and walk off some of yesterday’s calorie count, a chilly but sunny morning was perfect for a stroll along the Vltava to the Franz Kafka museum. 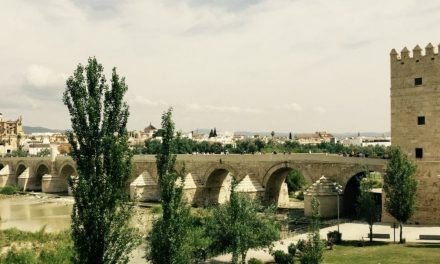 Given that our total combined knowledge of Kafka was an uncertainty about how to use the term “Kafkaesque” we figured it was a worthwhile project and what did we learn? Kafka was a bit of a miserable git really, clearly a very clever man and one of the revered artists of the late 19th, early 20th century but miserable. Cath left with a determination to read at least one of the books she had downloaded in preparation for this trip but not yet started and the Piss Fountain was an impressive installation- google it, you need to see the moving pictures. It was worth the visit just to see the statue writing it’s name in the snow. Figuring we had used up a fair amount of glucose in our brain cells it was time for a coffee and cake; taking the advice of our food tour guide we wandered to the back streets and found a lovely coffee house, Kaficko. We thawed out and solved some of the world’s problems, with honey cake and walnut cake, as you do after visiting an existentialist museum! A lazy day was needed on our 4th day in Prague, so we meandered through our neighbourhood shops and spent a ridiculous amount of money on cheese and salami. There are many deli’s in the this part of the city, but make sure you check the price before you buy. Which led us to spending an afternoon in our gorgeous apartment eating and drinking the fruits of our labours and planning the next steps through Central or Eastern Europe depending on your viewpoint. Apparently the Czech people do not see themselves as part of Eastern Europe but Central Europe, who knew there was a central part to Europe? Our 5th day in Prague was spent enjoying a food tour with Eat Like Locals, you can check our blog for more information. If you do find yourself in Prague, look these guys up, a wonderful way to explore the rich food, beer, wine and culture of the city. Oh and if you are lucky you will make a new friend, as we did. We are fast becoming funicular aficionados and Prague of course has one too, don’t all European cities? We, however, managed to miss the bottom of this one and considering we were already on our way up, went off on a pilgrimage to the top of the hill. Cath, ever the navigator, thought she had figured out how to get to the middle section where there was a half way stop. Instead of taking the snow cleared paths, you know not wanting to be like everyone else, we gingerly traversed the ice and snow laden paths up the hill, whilst observing a young girl who had chosen to go cross country. She spent a large amount of time ice crawling and bum sliding up the hill. It was quite amusing to watch, but we were in danger of doing the same as our course became more and more ice encrusted. Petrin Park may qualify as a small mountain, but once we were half way up the only way appeared to be to continue, giving the locals in the park surrounding us a good laugh. It remains a surprise neither one of us fell and broke a bone, or at the very least bruised our ego (or bum), but clutching at tree branches and hopping from one leaf patch to the next, we finally we made it to the top. The vista is magnificent over the city and surprisingly enough, we found the funicular! An hour’s climb took about 3 minutes to descend in the very sweet little carriage. 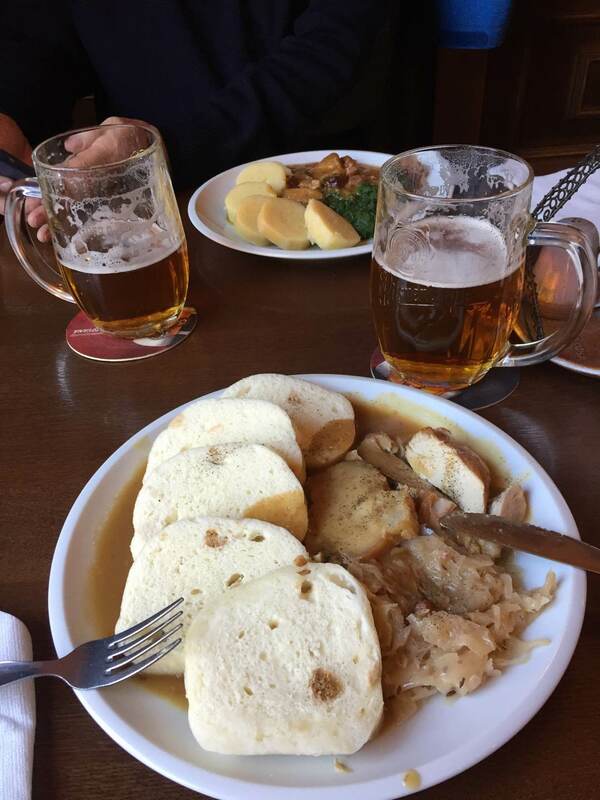 All that exercise justified a beer, as the Czech’s would apparently do at lunchtime on a Friday, so we arrived at our local beer house U svatého Filipa a Jakuba, just in time to beat the lunch hour rush, 2pm appearing to be that time. The bar maid was kind enough to point out that the English menu was much more expensive than the daily specials and when we asked for a traditional sausage meal she was a bit offended, explaining that “you can get that stuff anywhere- like Germany or Poland!!! !” We, rather chastised, went with her suggestions and it was pretty basic but very tasty fare, including garlic soup, which may not have been a winner with those we spoke to in the afternoon, but tasted great. Having decided that one enormous beer was enough for lunch we were off to find the Klemintinum Library as we had seen pictures of a very ornate building and Cath is a bit weird about needing to visit the books wherever possible. After jumping on the wrong tram we decided the train was best and were quickly on the other side of the river and off to see the library which sadly, once we found it, was closed for restoration, bugger! We have not really had much luck visiting libraries on this trip so far. Our last day in Prague also included food; by this stage you should not be surprised by that.We had a late (and long) brunch at Cafe Lounge , located just around the corner from the more famous and expensive Cafe Savoy. Again if you want to escape the cold in a cosy, romantic cafe with quality food and coffee this is the spot for you. 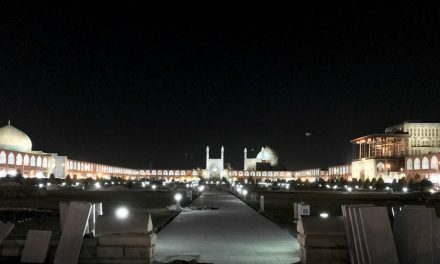 It is a gorgeous building, decorated in the early 2oth century Seceze style. Before wandering off into the myriad laneways and alleys, imagining that we were not just visiting but part of the place. It does however get pretty cold for two little sun loving Aussies, once the sun starts to go down, at about 4pm, so it was time to head home, get organised for our next trip and rest our weary legs before heading out for the evening’s entertainment. Prague is famous for jazz bars and it was jazz time, however when we arrived at the JazzDock, a couple of blocks from our apartment, we were informed by a rather haughty young woman at the door, that there was no room. It didn’t look that full from our vantage point but maybe we didn’t quite fit the young and trendy demographic! So we ended up settling for a quiet red and off to bed. If you or anyone you know find this information useful please like and share using the social media buttons below. If you would like more information or to give us feedback on this post please contact us or leave a comment below. 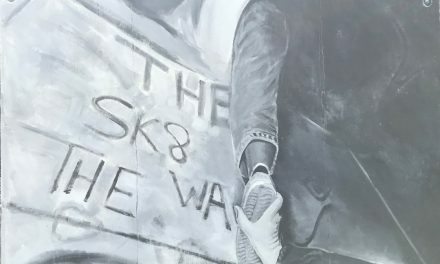 Nice post about Prague. I wish I can visit this place someday. Thanks for all the information. We were in Prague this October and it looks so different in the winter. The landscape had changed entirely. Both seasons are so attractive in their own ways, but I love autumn more. Everything I have seen and heard about Prague is that it is beautiful. You showed it is in the winter too. Im sure it was less touristy for you. I glad you were able to see some snow and have some really warm and cozy places to catch great meals! Prague is still on my bucket list although I must say I’ve never thought about visiting in the winter. The snow scene looks beautiful! Hi Suruchi, thank you for your comments, we hope you love Prague as much as we did. Keep an eye out for our upcoming Prague Travel Guide to help you with your planning. 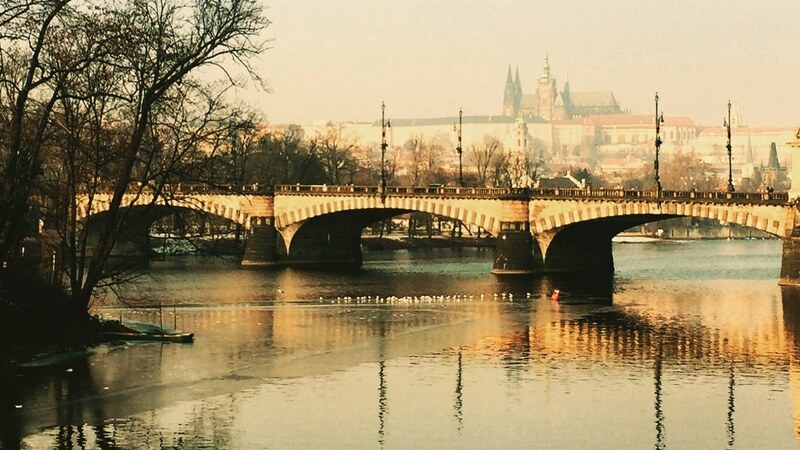 Glad that you were able to enjoy Prague in the snow but still with beautiful sunshine. A crisp winter’s day is such a wonderful thing, though I’m less happy when it’s snowy but also dark, wet, cold, windy! 😉 I visited Prague in the late 1980s and would very much love to go again, I travel in a different way now to my teen years (of course!) and although I adored the city back then too I would pay more attention to the architecture, food and culture now! Looks magical as a winter break! I haven’t been there yet but I would love to!! Love the statue of the guys taking a wee haha! Nice post, I really wish to visit Prague soon, it looks like a fairytale town. Those Jazz bars would have added some amazing aura to that place. Prague is definitely on my bucket list. You have a lot of great tips & it looks like you had a great time. 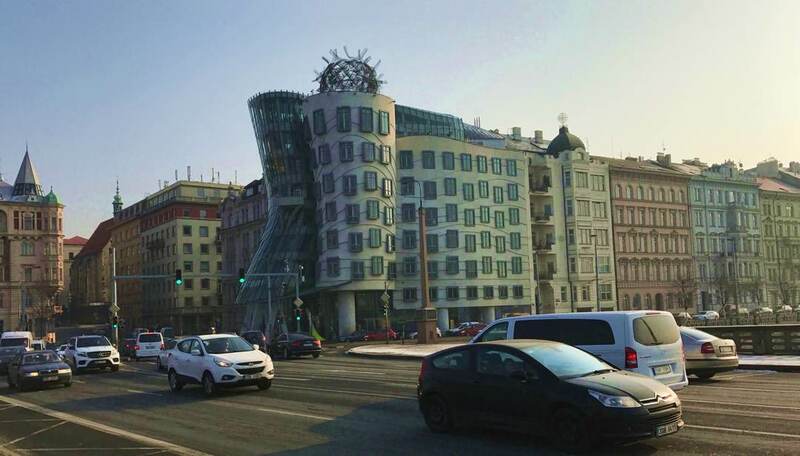 I have never been to Prague, and it looks like I have been missing out! It’s a pity, since I live in Paris and it’s really not far. It’s a good idea to go in winter for the different atmosphere. I can perfectly imagine myself taking pictures Petrin Park, I love higher grounds too! Lovely read! I was just recently organising some photos from a trip to Croatia a few Christmas’ ago and it makes me chilly just thinking about those beautiful yet freezing Eastern (and Central) European cities at Christmastime! I love a good Christmas market and fairy tale city in the snow, but these California bones can hardly handle a day out in those temperature! Though I’ve been lucky to see a fair bit of Eastern Europe, I haven’t yet made it to Prague or Budapest and they’re both at the top of my list… and this post has definitely pushed me to go for it sooner than later! I have never been to Prague before, but after reading your post it looks a fun place to visit. I would like to see all the attractions including the Prague castle, Charles Bridge and the astronomical clock. Hi Trupti, thank you for your comments. We are sure you would love Prague, it is a very special place. I went to Prague years ago and can’t wait to go back with my husband and 4 year old! This looks awesome! What a great post! I would love to visit Prague one day. I think I’ve been there before, but I was too young to remember. I especially want to see the Charles Bridge. 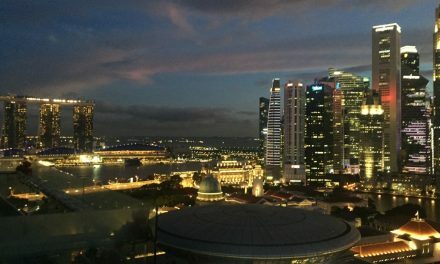 Thanks for the lovely account of your trip! Nice post about Prague. We also enjoyed staying there – you may come back in summertime again to have the beer outside the bars. I’ve always wondered how life would be like in the Czech Republic for a traveler. It’s a country on my to do list the next time I travel to Europe. great tips for a trip to Prague. It’s on our bucket list!